Multi-purpose microfibre cloths. Efficient with just water. Removes 99% of bacteria. Machine washable 500 times. Removes dirt, grease and dust with ease. 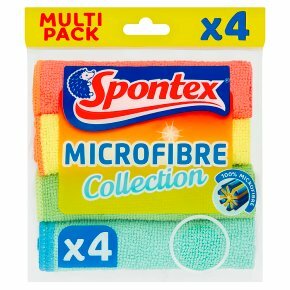 Spontex Microfibre Multi-Purpose Cloths are long lasting and super absorbent, they are ideal for removing dirt, grease and dust from most surfaces. Efficient with just water, so no need for chemicals! These versatile and brightly coloured cloths can be used, either dry or damp, all around the house for different tasks. Did you know? Spontex Microfibre cloths are made up of thousands of tiny fibres, so the number of contact points with the surface are greatly increased compared to non microfibre cloths. This means that each cloth has extraordinary cleaning power that eliminates 99% of bacteria. Being efficient with just water and no need for detergent, the cloths are ecological too. What's more, these microfibre cloths are so hard wearing, they can be washed in the washing machine 500 times and more! Cloth size: 30 x 30cm. Composition: 80% polyester, 20% polyamide. Assorted colours, mixed pack. Machine washable up to 60°C with similar colours as colours may run. Do not use fabric softener and do not tumble dry. Cloth colours may run or stain so test on an inconspicuous area of the surface to be cleaned before using. Do not bleach, iron or dry clean. WARNING: To avoid suffocation please keep this wrapper away from babies and small children.